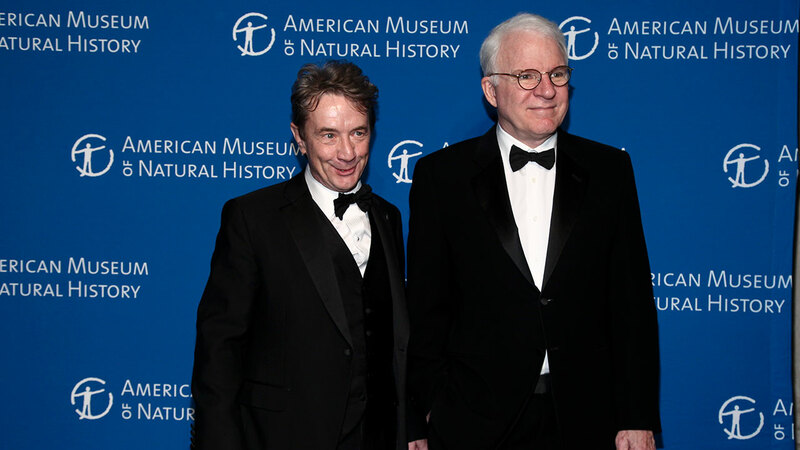 NEW YORK -- Comedians Steve Martin and Martin Short are gearing up for a national tour, offering a show with plenty of jokes and music - but precious little politics. The duo say they'll be stepping gingerly around the topic of Donald Trump and the election during their "An Evening You Will Forget for the Rest of Your Life" tour, which launches Friday in Sarasota, Florida. "I think it's more important to find safe islands where you can put all this endless negative energy aside and celebrate something that's perhaps non-partisan," said Short. "It's like when you have a fight with your wife. It's always difficult for either side to admit they were wrong. Right now, no one's going to admit that they were wrong." The show, which visits dozens of states from North Carolina to California, includes stand-up comedy, film clips, musical numbers and conversations about their lives in show business. Martin thinks it's too early after a divisive election to add partisanship to the mix. "I believe that the community of America is extremely volatile right now," he said. "I think it's time to lay off it because for people who are vested one way or the other, it's very hard for them to laugh at it. In time, it'll be fine. In time. But right now, it's like, 'Are you with us or against us?'" The show will have costume changes, improv, bluegrass from Martin's six-piece band, Steep Canyon Rangers, and show tunes from Short and his accompanist, pianist Jeff Babko. There's even a bit of cross-dressing. ("We do that mostly backstage," Martin joked.) The comedian Catherine O'Hara has called their act a children's show for adults. "The form is loose enough that we can keep changing bits, taking bits out that we're tired of, adding new songs, adding new comedy ideas," said Short. "We really are trying to go for a wall of laughs." Martin and Short have been friends since the 1980s. They have worked together on films like "Three Amigos" and the "Father of the Bride" franchise. Both adore the comedy of Mike Nichols and Elaine May and still make each other laugh. "When I'm offstage and Marty is doing his solo 10 minutes in the show, I sit there and admire it. It's like he's doing it for the first time. I couldn't do it," said Martin. "It's just so great to have a partner you think, 'This guy's really good.'" They both said the health of comedy is good, citing a bumper crop of late-night TV shows, well-written sitcoms and the democratization of the internet. They're fans of the next generation of comics like Melissa McCarthy, Amy Schumer, Fred Armisen and Bill Hader. "I think there's a lot of great things going on in comedy," Martin said. "The more actors work, the better they become," Short added.